Welcome to our pink teddy bear photo gallery, with pink bears submitted from all over the world by readers like yourself. Help us create the Web's biggest FREE teddy bear resource by submitting your own pink bears for inclusion. Simply use the form here. 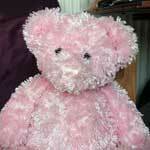 Pink bears are fairly common now and I'm sure many of you will have one at home (don't forget to share it with us here). 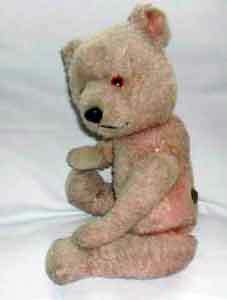 However this was not always the case and you may have noticed that there are not too many antique pink teddies around. The fashion for coloured teddy bears didn't really take off until the 1930's. This was mainly down to the fact that the First World War had resisted the production of traditional bear fabrics and so alternatives had to be found. Later of course, new synthetic materials made colouring plush much easier and easier to look after. One of the problems with colouring fabric is that over time it can start to fade and indeed many of the early pink bears can look completely bleached with just a tiny hint of colour remaining. Teddy bears which were dressed fared better as the clothes protected the main body of the bear. 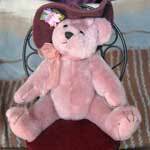 If you come across old pink bears you will notice that most of the colour can still be seen on the body but not the head. This picture of a Chiltern Hugmee bear is a great example of just how much the color can vanish, pink being one of the worst colours to suffer this light fade. Please type at least 150 words to go with your submission. The more you can tell us about your bear, why you love him etc the better.